Ever since the 1960s Swedish public service television has always aired a special Christmas calendar TV series counting down the days to Christmas eve, and over the years there have been many story variations, from fairy tales to ghost stories, but this year's edition is leaning heavily towards science fiction. The show, produced by Warner Brothers Sweden, is shooting right now and up until the first week of May in Stockholm, using the Panasonic Varicam 35. I was alerted the filmmakers were using a very impressive setup, so I made arrangements for a set visit and pretty soon found myself at one of the largest soundstages in Sweden, located at Swedish television's headquarters in Stockholm. Cast and crew are very busy, so one has to tiptoe around the studio, but the set is quite spectacular! A giant movie screen -10 metres tall and 16 metres wide- has been constructed especially for this project. That's actually big enough to dwarf all but a handful of the commercial Cinema screens you will find here in Sweden. Think Big! The filmmakers' ambitions are obvious in this shot of the front projection-set up created for this year’s Christmas calendar. The giant movie screen -16 metres wide- was constructed especially for this project and can be seen in the background here. The Varicam 35 proved indispensable for shooting this. A short distance in front of the screen the filmmakers have placed a raised platform for the three young actors to work on. They´re dressed as astronauts and the current set design is for a world dominated by volcanoes and molten lava, so the video image projected on the screen is suitably dark, ominous and fiery red. 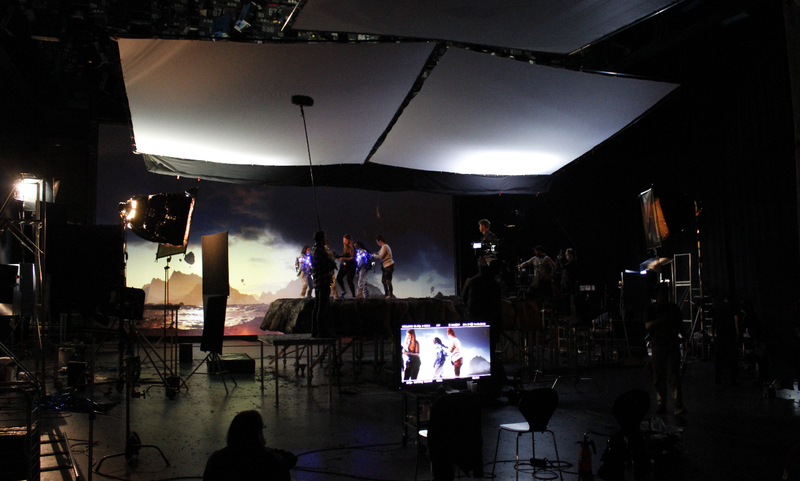 The light level in the studio is really low, balancing the lights on the actors and the image on the giant screen. 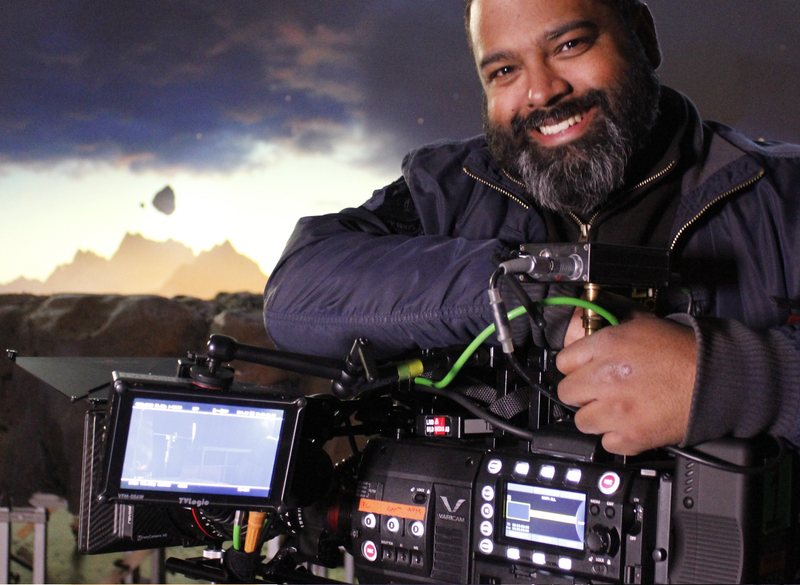 The director of photography on this show is Andres Rignell, FSF, and during a short pause between setups he was kind enough to share his experiences working with the Panasonic Varicam on this project. The show is a little unique in that it has two directors, Tord Danielsson and Oskar Mellander, and Andres accidentally met with Tord last year when they were both working on different projects but at the same production company. They found they got along well, and a few months later Tord and Oskar offered him the job to shoot this Christmas calendar. Being such an ambitious project, preproduction was quite extensive, and Andres wasn't able to participate as much as he wished, since he was busy shooting another feature. But one of the most important issues during the preproduction process was to verify that the front projection concept, that was very important to Tord and Oskar, was actually going to work. So a much smaller front projection setup was constructed and tests were shot with the camera the filmmakers were originally planning on using for the entire show. The filmmakers were somewhat alarmed when the tests revealed that the camera couldn't quite handle the low light levels necessary for this front projection setup. In order to get a usable image at all they had to push the camera really hard, resulting in unacceptably grainy images. Man with a Movie Camera. Andres Rignell, FSF, and the Panasonic Varicam 35. At that point Andres suggested to the two directors that what they really ought to do would be to get hold of a Panasonic Varicam for all the front projection work. Other prominent cinematographers -for instance John Christian Rosenlund, FNF, in Norway- have noted that the Varicam will indeed give you usable images under low light circumstances where most other cameras will give you no images at all, so Andres felt confident that the Varicam’s native 5000 ISO sensor would be a big plus to the show. In fact, getting hold of a Varicam in Stockholm at short notice proved to be a a bit of a challenge in itself, but happily Andres was able to acquire a Varicam 35 from fellow D.P. Michael Kaare Petersen, FSF. And that was about as far as we got when everyone was yet again called on the set for the next take. Happily, the shots lined up went flawlessly and the interview could continue. This time one of the directors, Oskar Mellander, was also available for questioning. Oskar is actually also the technical mastermind behind the project. The Varicam’s sensor was initially designed as a 5000 ISO unit, and will give its best performance in terms of dynamic range at that ISO. Also, at these extremely low light levels the camera features a very cinematic random grain pattern – that actually has nothing to do with the sensor - looking very much like film grain. The result is that the Varicam yields very film-like images, and as Oskar very much wanted a 1960s, 1970s feel to the front projection shots, he is very happy with the way the footage is turning out. The Director´s Headquarters. 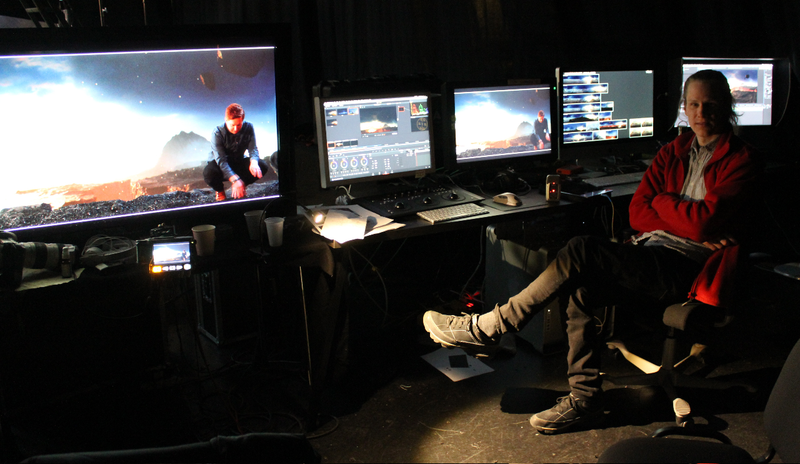 Director Oskar Mellander lords it over a small forest of computer screens. Andres is accommodating the director’s vision of a semi-vintage look by using a lot of tungsten lights on the set. The results, as can be seen on the big on-set monitors, are very pleasing. Andres elaborates on why the Varicam has been so valuable to their work, and explains that merely being able to get a usable image of the projected screen wasn’t enough, they actually also wanted to be able to stop down the lens somewhat, in order to get a decent depth of field. So they regularly stop down the Canon 17-120mm zoom that is used for the entire production to T2,8 - T4. This gives the projected screen image a nice definition, rather than just becoming a blur behind the actors. Another delicate problem that they had to contend with while setting up this front projection rig, is that every light in the studio threatens to wash out the projected image on the movie screen, therefore especially the light sources in front of the actors had to be set at a very low light level indeed. Andres actually pushed the ISO on the Varicam to 6 400 in order to make this work. Oskar explains that the projected footage is digital artwork at enormous resolution, so that he’s able to select and use just a portion of it on the screen, and then it is run as a 30 second loop. Working with front projection like this is a life saver for the show, because they could never have managed to do all these shots as green screen, it would have taken too much time. Over at 'video village’ Oskar has a small forest of computer screens, enabling him to feed the digital artwork to the projector, but also to keep track of the quality of the final image. He's especially careful to avoid excessively low values that would further on down the line threaten to introduce noise in the imagery, but this has amazingly not been a problem at all so far in their work. The filmmakers are shooting at 4K resolution, using the Varicam’s AVC intraCodec. The final result will be broadcast at 1920*1080 however, so there is plenty of quality to work with. Movie Stars: From left to right, Vincent Wettergren, Monna Orraryd and Naima Palmér are the stars of the show. Once again 'the bell rings’ and everyone hurries back on set for the next take. In parting, Oskar explains that further on down the line in the script the young astronauts will visit an arctic world, where everything is covered in snow and ice. Andres smiles at the prospect of these much brighter arctic backgrounds, they're going to make his job a lot easier!